Yadier Benjamin Molina, nicknamed "Yadi", is a Puerto Rican professional baseball catcher for the St. Louis Cardinals of Major League Baseball (MLB). He has played his entire 15-year major league career with the Cardinals since his debut on June 3, 2004, and also for the Puerto Rican national team in four World Baseball Classic (WBC) tournaments. 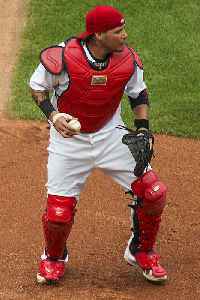 Widely considered one of the greatest defensive catchers of all time, Molina is the recipient of a number of accolades, including nine Rawlings Gold Gloves and six Fielding Bible Awards. A two-time World Series champion, he is a paramount figure in nine Cardinals playoff appearances and four National League (NL) pennants, and a two-time silver medalist with Puerto Rico. Molina bats and throws right-handed, stands 5 feet 11 inches (1.80 m) tall, and weighs 205 pounds (93 kg).